So as I approached 100, I really wanted to have an epic "I just finished this awesome quilt I started in 2003" kind of post... but that's just not what life had in mind for me at the moment. I have been doing some sewing, which is so good for my sanity. So I am working on that quilt from 2003. It's my ALYoF goal for September, and I have another week. This worries me. It might mean that I quilt more simply than I think I'd like to, just to knock it into the completed column. At the moment I'm piecing the backing. There's been a lot more thinking about making progress than actual progress being made so far this month. I look forward to showing it off when it's done. I've started a couple new quilts. Yes. I know. I'm crazy. I have a WIP list as long as my arm. But I saw these cute Little Letters sew along from the Temecula Quilt Co. when I surfed onto Tanya Quilts in CO and I just couldn't resist. I've been organizing my stash and I have 1 1/2" strips which I'm not convinced that I'm excited about using in general, so I was glad that this project would use some of them up. I've decided to make two quilts, 'cause why not. One is in a brights color way and the other is in blues and greens. I'm using the same American Made Brands solid gray background for both. They are putting out two letters a week. It's nice to be caught up and seems feasible to be able to keep on schedule with the sew along. I also started my Memory Houses!! 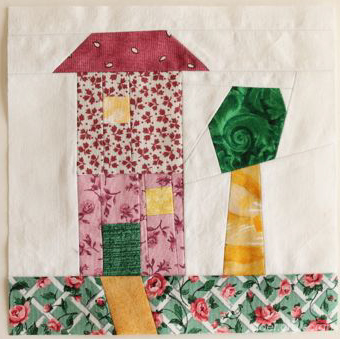 I was inspired by Jo and her Memory Cats, a reminder of her past quilts by creating blocks using her scraps from each finished quilt project. When I saw her Memory Cats a few months back I thought it was a wonderful idea, and I knew I had scraps from many of my quilts since I'd been organizing my stash. So I went to work grouping my scraps from each project and looking for the missing pieces. (The only quilt I have no scraps from is this one from 2005.) In the last week I made the final decision that I would use solid white for my background and got to work. I've finished two blocks. They are 6 1/2" square. I'm working in order (for now), so this first one represents my very first quilt. I've known I was "all in" on this blogging thing for quite some time now. I'm having a great time and it's helping me stay motivated with my projects. As for updates to the blog, I've mostly been thinking about what I want to change. Like creating new social media buttons and creating finished quilts pages. All in good time. And likely not before 2015. I use WordPress and have been very pleased with the free themes and plugins available to make my blog do what I want it to do. I'm also inspired to get back to learning some coding so I can customize my WordPress theme. In honor of my 100th blog post, I've made a donation to Tiny Forge theme creator, Tomas Mackevicius. I appreciate the work he's done on creating the theme that I've been happily using for the past 8 months. I also really appreciate all my readers. Thank you for being here and for making this fun. Posted in Quilting. 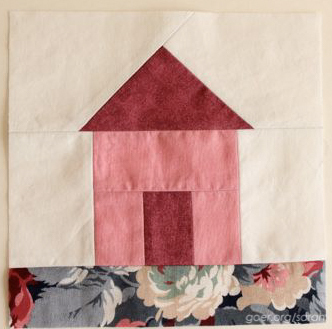 Tags: little letters, memory houses on September 24, 2014 by sarah. i love seeing what you do. i wish i had the 'stick-with-it-ness' to do anything like this/these. Great creativity as well. !! Thank you so much, Brandy. You are so sweet. Thanks, Jasmine. 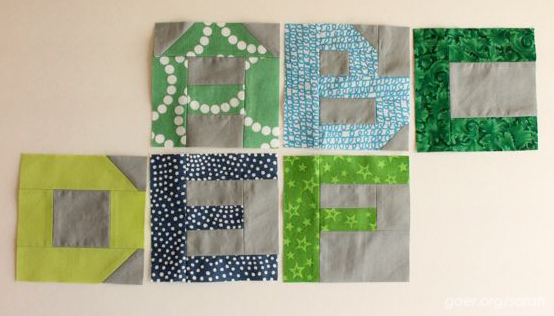 I kinda feel like I'm just making these cute little letters and then they will magically be a completed quilt top at the end. I love your memory houses! You've inspired me to dig into my scraps for a walk down memory lane! Congratulations on your 100th blog!!! The displayed quilts are beautiful. Love all that purple since I am a purple fan!! 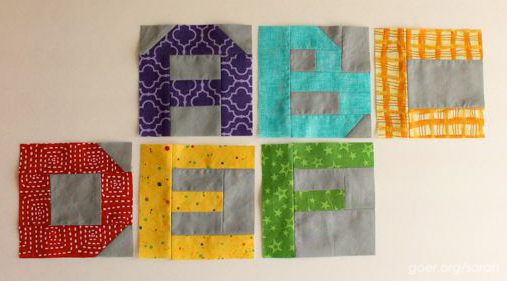 Clever idea to use up your scraps the way you have. If you want to get back to coding, wait a bit for the Tiny Forge II, it will bring much more (and less at the same time) to the table! Thanks for the heads up, and for stopping by!